Friday 13th - Oh Boy! 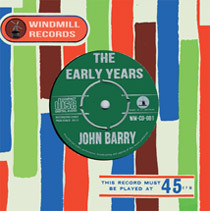 Later this year telerecordings of the "Oh Boy!" series are likely to be shown regularly in America, the first British musical TV show to be so honoured. Films of recent shows have already been shown to executives of U.S. networks. ABC expect to sign contracts very shortly. Programmes would not be transmitted there for some time. A big snag is artists' contracts and musical copyrights which, though valid in Britain, might not necessarily apply in America. When the new series starts in September provision will be made for American repeats. Tommy Steele appears again on "Oh Boy!" on April 4, with Lonnie Donegan scheduled for a fortnight later as part of Jack Good's policy of booking big stars. Steele was the first star producer Jack Good introduced to guest on the show, when he debuted on November 1. Donegan's only previous appearance in the series was during February. Also booked for the April show is Dean Webb, a new rock singer being managed by John Foster, who was associated with Cliff Richard's early career. Two MDs - Bill Shepherd and Harry Robinson - have been attending "Oh Boy!" rehearsals this week. ABC-TV announce that Shepherd and John Barry will be among the arrangers for the show in future. The company has failed to name Robinson's successor as musical director of the series at press time. In the High Court on Tuesday, the dispute between Harry Robinson and Jack Good over the name "Lord Rockingham" was put back a week. Good's counsel, Mr. Neil Lawson, Q.C., told Mr. Justice Vaisey the parties had come to terms in principle.